I have always had a habit of taking in orphaned or weak animals, trying to get them back to health, and, if applicable, weaning them back out in the wild. Many years ago, I came across a recipe that has become known as the “Miracle formula” because of the amazing way it rejuvenates a critter. I discovered it in an old animal raising book, with all sorts of old-fashioned and “outdated” information. I have made a couple tweaks to it over the years. I was feeding our orphaned kits this morning, and thought I’d share this tried-and-true formula. It can be fed to any mammal that you are likely to wind up with. In addition to the basic milk for sustenance, it provides an energy boost if necessary, a little extra salt to keep them thirsty and encourage them to drink more, and extra fat and protein, depending on the animal. 1 TBS. coconut oil (for extra, easily digestible fat) DO NOT SUBSTITUTE any other oil! It’s better to leave the oil out than to use something less digestible and risk diarrhea. I have substituted for some items, based on availability. For example, I’ve used cow milk instead of goat milk, sugar instead of syrup, etc. However, this recipe has the most success by far, probably due to the fact that is fresh nutrients, highly digestible by most creatures, and contains much of the essential fat and proteins needed by weak, sick, or growing animals. It can be fed by spoon, dropper, bottle, or dish, and as little as a 1/2 tsp for small babies, about 1 TBS. 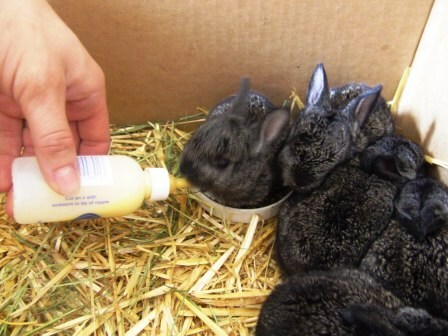 for larger animal babies or small adults, or 1/4 cup for large adult animals is usually all it takes to perk them up. You can use the basic formula as a sole diet for short term nursing, with pretty good success. Hope that helps someone with a future animal in need. You can also Use Blackstrap molasses instead of Syrup and Olive oil instead of Coconut oil. Good forumla I have used a similar one before. It usually goes by what I have in the house at the time. Hope your bunnies do well!! Yours had a decent start with mom nursing. Ours I dont think got much if any colostrum and then the 2 that looked like they were going to make it I think got over heated.. Ahh well another learning experience..
After using the vet’s formula for however long it lasted (It was a while ago, I can’t remember exactly how long it was) I fed Cleo pasteurized whole milk bought in the local store until she could eat “real” food. She’s 14 and still kicking – go figure! ?